The last step was to add a piece of the gold punchinella vellum under the sentiment. I trimmed a piece in an irregular shape to fit under the sentiment strip. I love how it makes the sentiment pop out as if it is pieced. That's it for me, folks! Next stop on the hop is Nichol! If you get lost, click on over to the Mama Elephant site to get the blog hop list! Wow, what a cool card, for so many reasons! The watercolor and the colors are so pretty, the gold embossing is such a cool look on that card,and those stamp images are great! JJ, gorgeous watercolors! Great color combo and love the gold. Cool Card! Love the look of the watercolour. Cool card! Great kit- thanks for the chance to win! Love the artsy feel to your card. Great colors too. Gorgeous card, JJ (as all of yours are)! You've worked magic with these wonderful "sweet" themed kits! Thank you for the giveaway opportunity and especially for sharing your creativity! Really love the collage style, and all the details. The vellum looks really good! I love the look of this card! The colors are so calming! Fantastic card, JJ! I love how you used the honeycomb vellum! OH MY! what a beautiful card. Now this is what I like. Just love you're ideas. Thank you so much for shaing with us. I never thought of using velumn like that and I love it. What a cute card, i love the color combination. I love that gold punchinella vellum! Your creativity just made it that much better! I love your card! Thanks for sharing! Gold and watercolor? I love it! 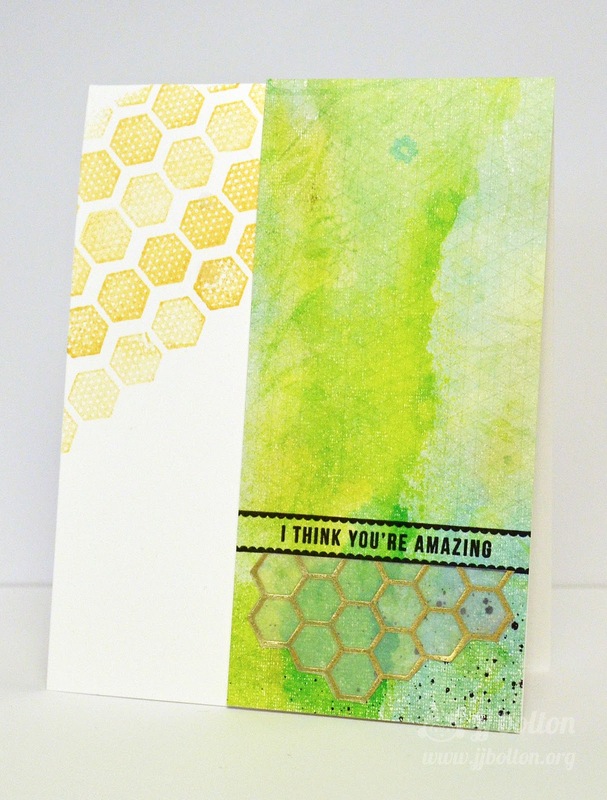 Love the combination of stamped hexagons and the punchinella vellum! Great watercolor work with the golds and the honneycomb vellum, love it!! So artistic, JJ! I love how you paired the papers with your stamping and the vellum is such a beautiful touch! Gorgeous card!!! Wonderful card!!! Love what the punchinella does for that sentiment strip......genius!! Thanks for the card inspiration. I really love how the vellum and corner stamping balance each other out. :) Cool color combinations. Love the colors~ so pretty! Gorgeous card, JJ! That gold punchinella vellum is fantabulous! I thought at first you embossed gold onto vellum. TFS! This is so cool! Love the watercolor---so pretty! And the honeycomb patterns are fabulous!!! Love the honeycomb pattern. I think that is something I would use frequently. fab card! love everything about it!!! So CAS ! Very vibrant! LOVe the card! The gold honeycomb is awesome! When I saw the reveal of SC's sugar rush I didn't realize that the honeycomb was vellum! Oh my goodness that is gorgeous! I simply love your cards. I do not know how I have overlooked your blog before but I fixed that. 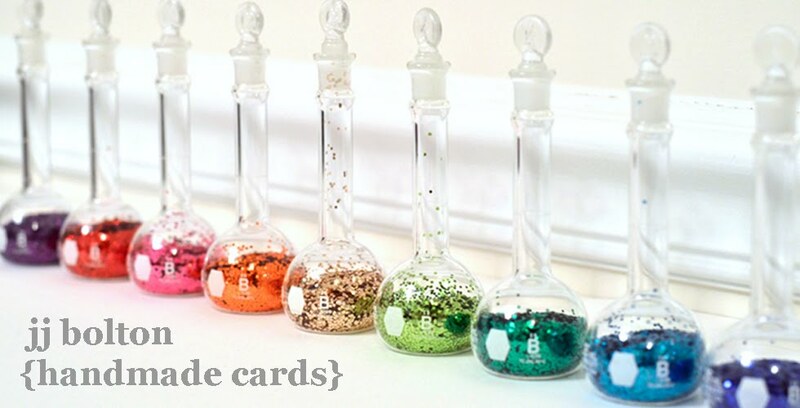 I am now subscribing thru bloglovin..your cards are just gorgeous! I could spend hours looking at your blog! Love how you used the sentiment and the papers!! WOW! Stunning design, love the fresh colors!!! Love how you do your cards. Love that punchinella vellum, eye catching. I swoon over the gold punchinella.... and love how you repeated the pattern with the stamp. Love the watercolor in contrast with the black stamp sentiment! Aloha to you too. you really are rockin' the gold on this card. Lovely card. The water color looking paper is so pretty. Thanks for chance to win, especially since today is my birthday. Cool card! Watercolor effect is nice! Love your card the colours are beautiful! Fabulous! Love the watercolor paper & the gold. Beautiful! Love your card...it just gorgeous! I love your card! I would just be floored if I was lucky enough to win the kits! lovely card - love the paper! Water color with the gold vellum paper - seriously stunning! That watercolour paper is awesome. Love the gold hexagon vellum piece! 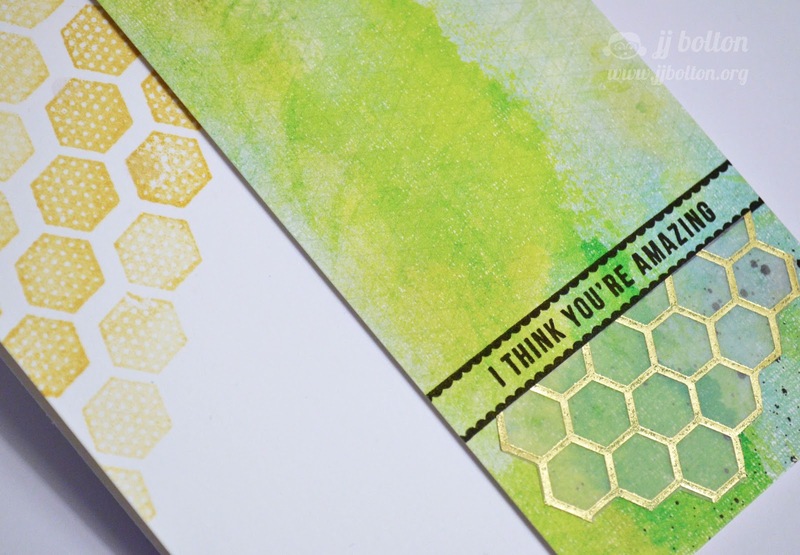 I really like the hexagon stamps - cool effect with the vellum! The card is amazing. Love the colors. love that vellum you use!! great idea!! Gorgeous colors with that fabulous pop of metallic gold! This stamp set is awesome. is an amazing card, love the fantastic green color! Really like the way that you used the vellum on the card- it is just perfect! Beautiful card......love that watercolor paper. Love the way you trimmed that vellum. It's just beautiful on this card. Fantastic card, love the colours and especially the way you used the vellum. Awesome!! love the way you used the colours and stamp. So pretty! I really have to hop on this watercolor thing. It's just too cute. Wow, I just love your background! Gorgeous!!!! Really cool card - love it! Love the black stamping combined with the soft colors of the card! Great design with vellum and color choice! Great design! Love how gold pops off the card! That card is too yummy! :) Thanks for the chance to win! Loving the gold touch on the mixed media paints and sprays. Great job! Love all the unique layered elements! Beautiful! I am becoming such a fan of the ink background on cards! Thanks for sharing your inspiration! I love the word-die cut heart.... so simple yet so effective! Absolutely gorgeous!! Love the color combo!! I love, love, LOVE the hexagons!!! Fun seeing this mixed media type card! Will need to try this! Beautiful card! Love the watercolors! Wow! That watercolor is so pretty! You always make amazing cards! I am a huge fan of the hexagon/honeycomb look. Beautiful card. Love this JJ! Your artsy, not fartsy, cards are wonderful. You should do more!!! Super awesome! Such a "wow" card. Love, love, love!! That paper just works so perfectly! The hexagons are so great! Wow, I love the cool techniques you used here! The hexagons are really fun, and such pretty colors. Love the card . . . thanks for sharing! Love the artsy look of this JJ! Great colour combo and composition! Pretty card - love the watercolor look. Very pretty. I like the gold/vellum hexagons. That watercolor look paper is so cool! Love the water coloured look and gold. Your card is so unexpected, I love it. So very artsy! Love it! Super card - love the randomness and colors - the gold really sets off the paper !!! Wow - this is awesome! Very spring-like and fun. The green and gold are so beautiful together on this card. And I love both sets of hexagons. They balance each other out so well! Such a great watercolour background...will definitely have to try that! What a creative card!!! Love the green and gold together - so pretty! Super gorgeous! Love that you've painted on top of the patterned paper! Beautiful cards.. my fav so far. Love the coloring technique you used.